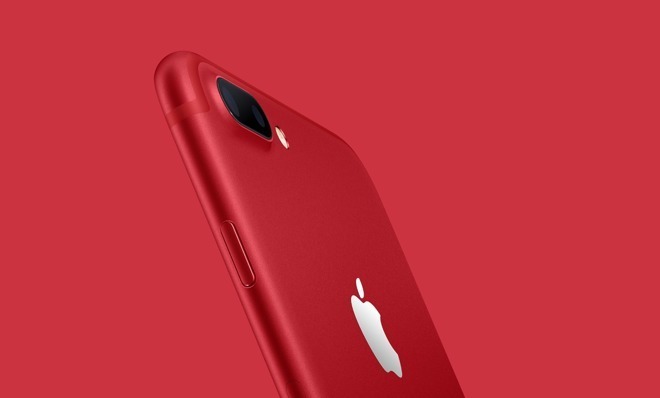 In 2017, Apple's sales of various (Product)Red-marked goods —including special editions of the iPhone 7 and 7 Plus —directed north of $30 million towards the Global Fund, which aims to fight AIDS, tuberculosis, and malaria. The figure equates to 144 million days of ARV medication blocking the transmission of HIV from mothers to unborn babies, Apple said in a Thursday press release. "By working with (Red) to stop the transmission of HIV from moms to their unborn babies, we're already seeing a significant impact in areas where help is needed most," wrote the company's Environment, Policy and Social Initiatives VP, Lisa Jackson, in a prepared statement. "We're committed to continuing the fight and empowering future generations through these vital efforts." Apple further claimed that during the past 11 years, its customers have contributed the equivalent of almost 475 million days of medication, raising more than $160 million in total for the Global Fund. The announcement comes partly as publicity for World AIDS Day on Dec. 1. Over 400 Apple stores will switch to a red logo for a week, and the company is promising to donate $1 to the Global Fund for each Apple Pay transaction made at its physical and online stores during the event. Game developer King will simultaneously be rolling out special in-app purchase bundles for Candy Crush Saga, Candy Crush Jelly Saga, and Candy Crush Soda Saga, from which all proceeds will go to the Global Fund.